Orchids look beautiful in hanging baskets. Many varieties of colorful and unusual orchids are easy to grow. Their showy flowers are long-lasting and grow well inside the house or on a covered porch. Dendrobium and Vanda are two orchid types frequently used in hanging baskets. Finished baskets should be placed in an area with good light but not direct sun, and free from drafts. Water when the planting mix is dry to the touch. Growing orchids in hanging baskets can become a wonderful hobby. 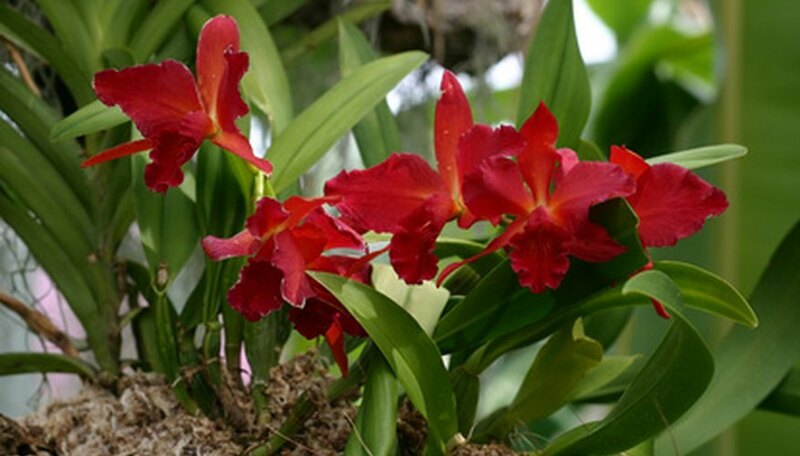 Remove the orchid from its nursery container and gently shake off excess potting mixture. Do not overhandle the root system. Fill the hanging basket 2/3 with orchid potting mix. Pack tightly. Orchids need air space and excellent drainage. Place your plant in the middle of the basket. Spread the roots gently to all sides. The potting medium should support the roots. Add additional potting mix to 1 inch from basket top edge. Press down firmly to pack tightly. It will take two years for the orchid to outgrow this pot. Water thoroughly before you hang your basket. Check for excellent drainage. The coarse potting medium should make water run through the basket easily. Hang your orchid basket in a household spot with good light but no direct sun. Water when topsoil is dry to the touch. Fertilize every two weeks with orchid fertilizer for better blooms.